MIT’s Dean for Humanities, Arts, and Social Sciences, Philip S. Khoury, has been named to serve as associate provost, the Institute announced yesterday. Khoury, who will take the position on July 1, will succeed current Associate Provost for the Arts Alan Brody. As announced in January, Brody, MIT’s second associate provost for the arts, will return to full-time teaching and writing plays after having served 10 years in the position and 18 years on MIT’s faculty. Khoury’s primary duties will be to lead MIT’s arts initiatives, including fundraising efforts. Among the projects Khoury is likely to preside over is a proposed Music and Theater Arts Teaching Laboratory intended to provide space for rehearsals and teaching. Currently planned to occupy 36,000 gross square feet on the corner of Albany Street and Massachusetts Avenue, the project awaits additional funds. Khoury will also be charged with enhancing interdepartmental initiatives, helping to lead MIT’s international programs, and supporting discussion about the relationship between science, technology, society, and policy, according to a letter to the community from Provost L. Rafael Reif. In his letter, Reif praised Khoury’s accomplishments over his 15 years as dean of the humanities, arts and social sciences, including the creation of graduate programs in Comparative Media Studies and Science Writing, as well as the expansion of MIT’s international education efforts. “Under his leadership as dean, the visibility and stature of MIT’s humanities, arts and social sciences programs increased considerably,” Reif said. 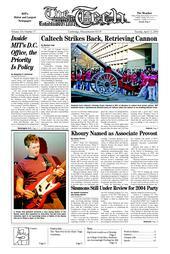 Khoury first came to MIT in 1981. He was named associate dean of the School of Humanities, Arts, and Social Sciences in 1987, and acting dean as 1990 before becoming dean in 1991. Khoury’s research interests focus on political and social studies of the Middle East. He has written a number of books, and is a fellow of the American Academy of Arts and Sciences. Reif will be leading the search to find a replacement for Khoury as dean of the School of Humanities, Arts, and Social Sciences. Confidential comments about the search can be sent to Reif in Room 3-208 or by e-mail to hassdeansearch@mit.edu.